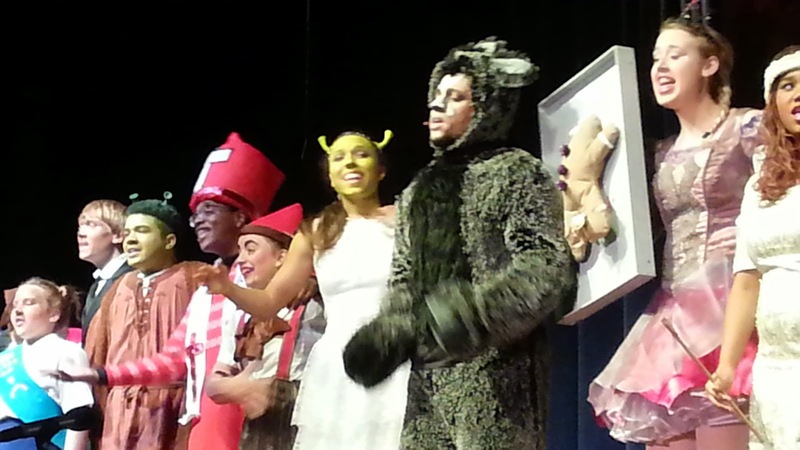 Last night, I attended a high school production of "Shrek the Musical." Seated next to me, in the front row, was a friend's three-year-old son. By his reactions, I would say that this was probably his first play. It is an absolute delight for a theatre educator to sit next to a small child who is experiencing a live stage production for the first time. His eyes were wide. He was absolutely rapt. He gasped, and held his hands over his mouth. He laughed out loud. He was full of questions: "Why is it dark?" "Why is she alone?" "What's that sound?" "Where did the dragon go?" He mimicked what he heard actors say, including the line, "I should have worn a cup," which may or may not have made his phys ed-teacher father proud. He put his head on my shoulder, which, I'm told, is quite unusual for him. He got scared as the dragon got closer to the edge of the stage, and needed the safety of his dad's arms, so over the back of the seat he went, to his dad in the row behind us. I'm in a place where "regular" theatre doesn't excite me much anymore. I need new and different stimulation. I guess I'm kind of jaded. But spending the evening next to a child who's just discovering theatre was, for me, an incredible reminder that what we do can be magical.